Brothers, we have determined that somewhere out in the ether of space there is another realm, a realm where those who live, breathe, and sleep may very well control the fate of our poor, misfortunate world. The Brothers of the Watchful Eye theorize that our world is plagued by creatures built upon nothing more than the dreams and nightmares of that other world. But lo, before you scoff, think about the power and terror of your own nightmares. In order to better understand and defend ourselves from these creatures, we have begun to catalogue their habits and powers. Brothers, we are truly at war with monsters and I pray to all the gods to deliver us from this evil. 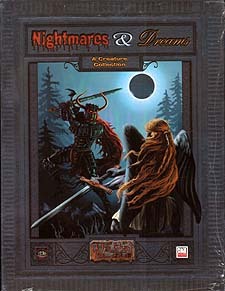 Nightmares and Dreams is a d20 System core book for The Hunt: Rise of Evil campaign setting that presents a menagerie of creatures and items that demonstrate the power that our dreams and nightmares might have on other realms. Although, the material presented here relates to The Hunt: Rise of Evil, it can easily be adapted to any d20 campaign. Each entry has an original vignette that helps to explain the origin of the creature and also serves to set the mood for adventures based around these monsters. Requires the use of Dungeons & Dragons Player's Handbook and Monster Manual, Third Edition.